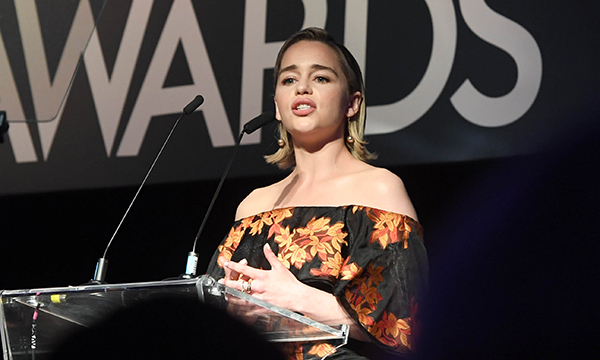 RCN ambassador and actor Emilia Clarke has vowed to champion a new generation of specialist nurses, having been inspired by the care her father received before his death. Speaking at the RCNi Nurse Awards ceremony in London tonight, Ms Clarke told nurses that the NHS and other health services ‘simply could not function without you’. However, she added, ‘today’s nurses appear an easy target for cuts, not the priority for investment’. Ms Clarke, who is known for starring roles in the hit television series Game of Thrones and the Star Wars film Solo, became the RCN ambassador earlier this year. She told the audience her experience of her father’s death two years ago had been shaped by the nurses who had cared for him and supported her. ‘I was given the opportunity to be involved in the intricacies that made up a day of trying to save his life, and it showed me with such clarity not only the awe-inspiring skill that the nurses clearly had, but the emotional intelligence that came along with it,’ she said. In her speech, Ms Clarke contrasted the care nurses gave with the ‘heart-breaking’ lack of support they have received in recent years, referring to the cut to training budgets and the removal of the student bursary in England. ‘To force the people who save our lives to live on food stamps has to stop,’ she said. Ms Clarke vowed to support the development of a new generation of specialist nurses who would ‘deliver innovative practice, improve survival rates and reduce hospital stays, and help those with long-term conditions to live their lives to the full’. ‘I vow to champion nurses and support workers and to help you gain the recognition and money you deserve,’ she said. Later tonight Ms Clarke will present awards to the RCNi Andrew Parker Student Nurse category winner, as well as the RCN Nurse of the Year.